What makes entertainment in drum corps? Michael Cesario addresses the room on Friday, Jan. 21. 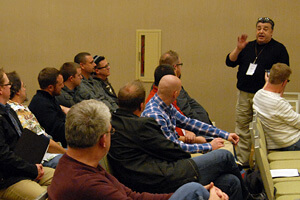 Many of the sessions for judges, instructors and designers this past weekend at the DCI Annual Meeting in Indianapolis, revolved around a spirited discussion on the value of entertainment in drum corps productions, and more specifically in regards to a rule proposal that would give judges the opportunity to award points for a corps' ability to entertain its audiences. While the rule proposal was later sent along to a task force for further review and development, DCI's new artistic director, Hall of Fame member Michael Cesario, kicked things off on Friday, Jan. 21 with these challenging remarks to the assembled group.